Before YouTube, before MTV, and before just plain TV, the best entertainment was listening to the radio. 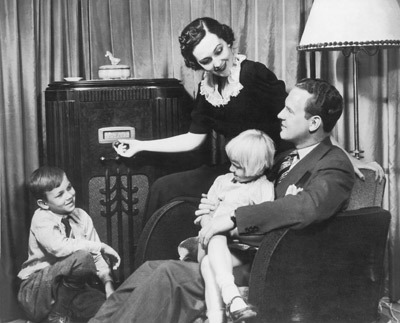 Whole families would gather around their radio "sets" (the radio's were huge!) to listen to shows. The shows had actors for the voices, but included great sound effects and music to help create the mood to make the shows enjoyable and exciting. Today radio shows have taken on new life as people podcast instead of using just the radio to broadcast their shows. After we learn how to use Audacity to edit sound files (audio files) we are then going to work with a partner or two to create your own radio show based on one of Aesop's fables. Ready to start? Just work through the following activities, and at the end you'll have a show you'll be proud to share! Listen to the Radio Shows from 2011! !